He finished second in the event on the Piste National held under floodlights in the Swiss resort. It's his second podium of the season. However, although the race was contested by 21 racers, including some of the world's top alpine athletes, it was not an official International Ski Federation (FIS) race, so does not count towards World Cup points. It was organised by the Crans-Montana resort. "Every slalom should be a night race!" Ryding said on Instagram after the event. The Brit was sandwiched between two Frenchmen. The winner was Clement Noel, fresh from his second place at the Adelboden World Cup a few days earlier. Ryding, who is currently 7th in the World Cup slalom standings, was joined in the race by some of the leading slalom skiers. They included the Olympic slalom champion, Sweden's Andre Myhrer, who finished fourth. 32-year-old Ryding was last in action on Sunday when he failed to finish the first run in Adelboden. "I am looking forward to racing again, and especially a race with less pressure," Ryding said before the race. "My weekend wasn't ideal in Adelboden so it is great to get to race again so soon after! "I think the level of skiing on display will be really high." Six skiers failed to finish the first run in Crans Montana, including Switzerland's Daniel Yule. Two more failed to finish the second run. 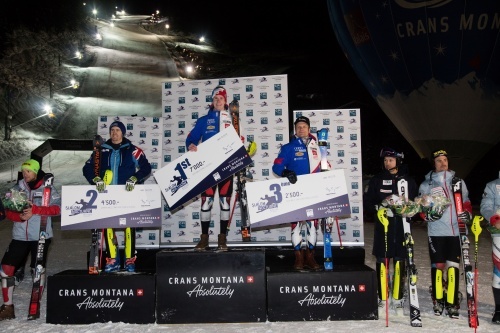 The format of the Crans-Montana night slalom followed a traditional World Cup race but was shortened. Crans-Montana is well-known for its Alpine racing heritage, with an annual FIS World Cup Women's Downhill and Alpine Combined races. The 2019 races take place on 23-24 February. Dave Ryding's next World Cup race is this coming Sunday in Wengen.